I’m Back!!! 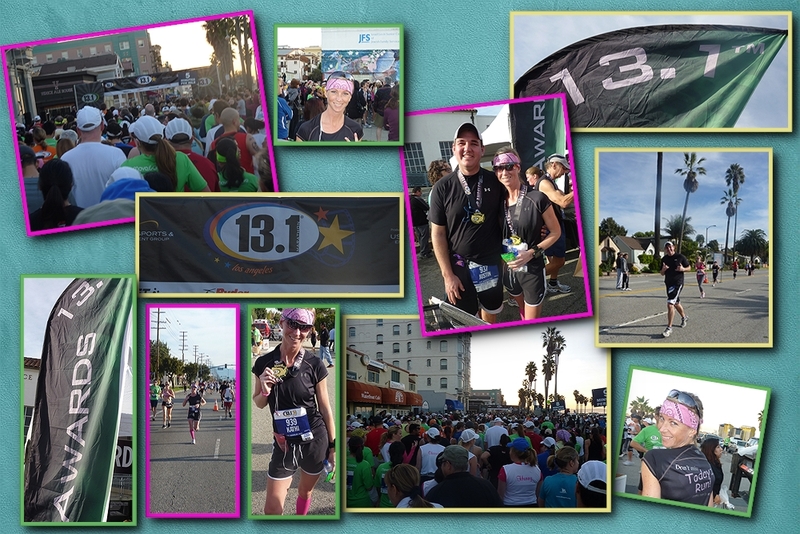 L.A. 13.1 Half Marathon!! | Todayz Run!!! I’m Back!!! 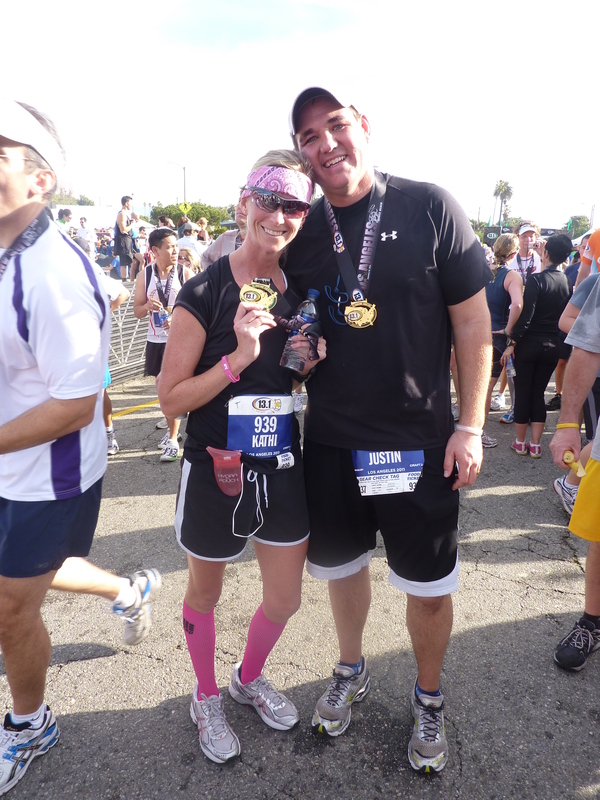 L.A. 13.1 Half Marathon!! Oh my gosh I love this sport for sure!! I had the most amazing time in California. If you ever have an opportunity to go run a race in a warm state…….pzzzzzht! (that would be a zip it to all that are blessed to live in a warm state) Anyway, I would so highly suggest it!!! The race started on Venice Beach. We were instructed to park in Santa Monica. We arrived about 45 minutes before the race. We started down to the beach following the other hundreds of runners. It always amazes me what people wear. What people are comfortable wearing. Most look awesome and totally inspire me. Others need……..possibly a mirror!! (However, I may be one of them that is in need of a mirror, but I love my badass bandana. It works so great!!! Yeah, I know I may look like a jack. I know that I look like I just came from a biker bar, especially if my hair is done juuuuust right!!!) Anyway, as we walked along the beach for about 15 minutes. The love of my life asked me if I could see the start anywhere. You know in fact I could not see the start at that time. I couldn’t figure out where we were walking to. I was just so entertained by everything I was seeing that I could not even focus!!! We walked about another 5 to 10 minutes and we could finally hear the announcer, and I could kind of see the start line. There were still hundreds of us still trying to get there. The lines for the pots were soooo long. Those peeps were never going to make it. As we got a little closer I hear the announcer say, “L.A. 13.1 runners are you ready to get this party started?” I thought, “Um no because we are still walking the 3 miles to get to the start line that we were not informed about”. Then the cute announcer says, “Okay runners we are about 3 minutes from the start”. Well that little announcement just started a pre-race race for sure!!! The love of my life and I started to pick up the pace. We still needed to drop off our stuff. CRAP!!! So, about 5 minutes after the gun went off, I finally get to cross the line and I know my time chip is taking notes. I know that I am going to have to push myself to make up time after I get past a few peeps. I try to take off, but I can’t get around anyone. As I am running that first bit I see, what I think, is a lot of drug inspired homeless people. There were about 25 just sitting against these “market” doors. They appeared to be about my same age, so that is super young for sure!! The first thought that comes to mind as I am running past them, “Please just let one of these amazing runners inspire you to want more in life”. So with that I tried to make eye contact with each and every one of them. I flashed my traditional running peace sign and just smiled a little to let them know, “This crazy running life will treat you so much better than that. Push yourself to be better!” If nothing else I hope they have a great story of the crazy that smiles and waves as she runs!! If they were still high then it was probably like breakfast and a show for them. They should consider themselves Lucky!!! Once we were off the boardwalk of Venice Beach we turned onto Venice Beach Blvd. I figured that it was a major road and the peeps would start to thin out. Turns out big time races don’t thin out so fast. I was thinking, okay by the first mile I will be able to make a mini move. Then I went with, okay at mile two I will be able to make a mini move. Okay I will just wait until these peeps get out of my way!!! I seriously did not even see the first water station because the peeps were still so dense. Okay so the entire course is flat and it is not an exciting road by any means, but the runners are amazing, and the entertainment is even better. First up dancing at the church… Okay it wasn’t so much dancing as it was baton twirling, but the ends were on fire!!! Yeah, and then the dude blew fire at us. AMAZING!! However, his assistant was even more amazing, but only in the fact that, that chica was ripped and I wasn’t sure how she got that way. A crazy fire dancer and his ripped assistant. You don’t see that everyday!!! Or maybe you do in Venice??? Next we have bands. We have, “The dying roaches with sound”. Personally I don’t think that is a good name!! I think they need to work on that one. Like were they just sitting there and one dude says to the other, “We need a name”..”Yeah we do”… “Dude look at that roach”….”Cool dude”….”Hey can you hear that”….”No, what?”…..”That dying roach is makin’ a sound”……”That is the most amazing name for our band dude”. I don’t know I’m just trying to figure it out!!! Hey, they sounded awesome, so that’s all that matters right?!! After that awesomeness, we had a school band rockin’ out and a couple of other bands….with better names for sure, but I can’t remember any of them, so maybe “The dying roaches with sound” is a good name after all!!! There were cheerleaders all along the course. Lucky for them the race peeps made it super easy for them, because, our names were printed right on our bibs. The cute cheerleaders would make up cheers for a group of runners. They would yell your name. They did stunts. They were just plan cheerful dang it!!! Okay last but not least there was the families. I love the families waiting for their runner. Most are happy and clapping. The kids are always holding the cutest signs. They yell the funniest things. However, you can always tell who the mom is waiting for their precious baby to run by. I am not sure why but they always look so worried. It is almost like they think that their baby is running with a bunch of wackos!!! Um…..they are not!! P.S. to all the moms. Even if your baby has to walk they will make it to the finish line okay.. If they don’t walk fast enough they will be picked up and brought to the finish line!! No worries. Okay so that brings me to my favorite entertainers on the entire course. My personal favorite was the Tokyo Drummers. They were the best for sure! They were at mile 12.5 and it was a huge huge rush to hear the drums at about mile 12. As you got closer the drums got louder and even more awesome. Then as you would run past them they would get faster and they seemed to play harder. It was intense and amazing all at the same time, because, right when you ran past them you could see the finish line at the end of the road. You could hear the roar of the crowd. You could hear the announcer announcing names as each person crossed the finish line. Once I got about 25 yards from the finish line, I hear the announcer say, “We have a strong runner coming in. Check out her fantastic fuchsia compression socks. That is Kathi winning the most amazing socks of the day award! !” Yeah, for sure, but they are pink dude!!! Total rush for sure!!! I love this sport. Oh, did I already say that?! Hey did I just hear you say, “Hey Kathi are you going to wrap this up anytime soon?” Oh good cause I am not!!! Finished: 13.1 miles in 1:39:34 – 9th in age division out of 256 – 48th overall female out of 1313 – (overall I finished 263rd out of 2538 finishers). I was ranked as a regional class runner by the World Association of Veteran Athletes. I don’t know what that means, but it sounds so super cool to me for sure. What I Wore: Tech t-shirt, running shorts, CEP compression socks (pink! ), badass bandana (pink! ), my fave running shoes, and sunglasses. What I wish I had: Nothing!!! everything was perfect!! What was being repeated on the iPod: I didn’t listen to it until mile 10 and stopped listening to it by mile 11.5. Although, I did have to listen to Black Eyed Peas, The Time (Dirty Bit) a couple of times. 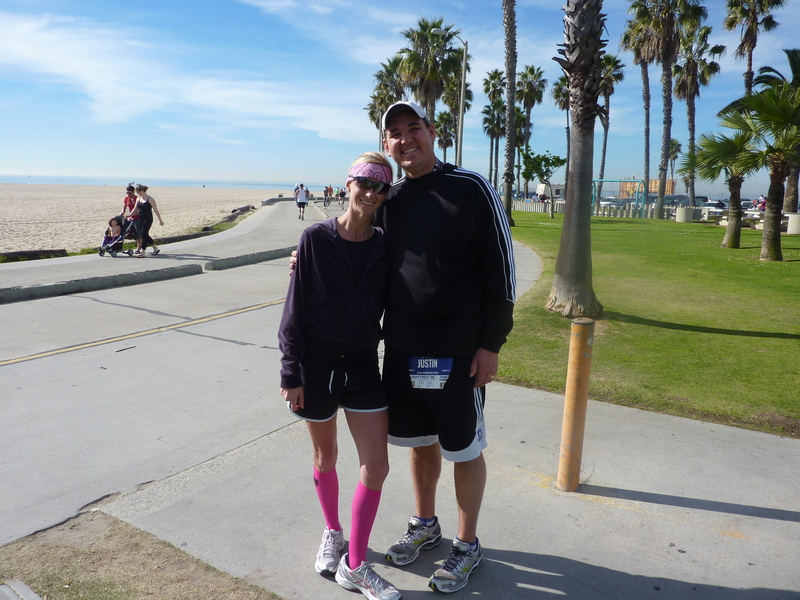 As we were walking back to our car after the race, I realized that Venice Beach is one you have to see for yourself. I realized that 25 drug inspired homeless people is not very many, because now there were a couple hundred of them. I was shocked because they seemed perfectly happy trying to sell their broken beer bottles. They were dancing to their own drums for sure, because there were no drums anywhere to be seen. I also realized that Venice Beach is really beautiful, but you might just want to hang out in Santa Monica!! Hey my friend sign up for your favorite race now. Oh, wait you don’t have one! Well find one!!! Even if you have to run/walk it, or just walk it all together. You won’t be the only one, and you might find that being a part of this crazy racing thing is super fun!!! Get out and live life more!!! This entry was posted in Half Marathon, Races and tagged Half Marathon, Races. Bookmark the permalink. 9 Responses to I’m Back!!! L.A. 13.1 Half Marathon!! WOW! Your time was amazing. Congrats. Congratulations! You are awesome! Your time is amazing! You must have been booking it. I am so happy for you! Keep it up because you are a true inspiration for me! Look at you go girl! Impressive. Funny. Inspiring. I am jealous! Good job Kathi! Oh and good job Justin as well! Thanks to all for all the kind comments!!! Was so much fun! As with most things it was awesome because my super fast wife was there with me. Kathi, super proud of you! Just thought I would stop back by here and tell you that I also think you are awesome. Your time is AMAZING and you look so dang cute in your socks and bandanna. Oh Thank you so much for your kind words!! Hey how do you feel about a dirty dash?